This Queen Anne style building has two stories, an asphalt shingle roof and has been minimally altered. It is a 4-bay, wood frame with asymmetrical form, a hipped roof and several gable dormers. There are 3 brick chimneys (2 on the right side and 1 on the left. It has a gabled 2nd floor balcony on the right side of the front façade. 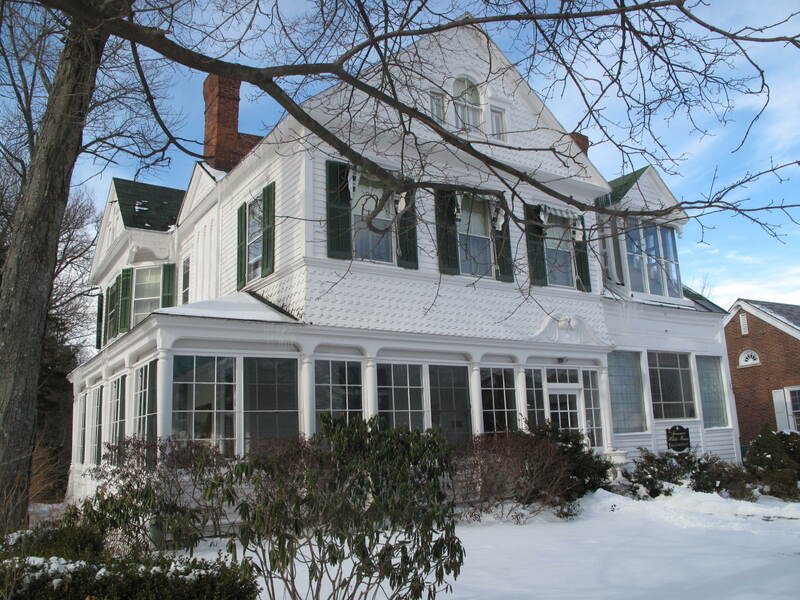 It has wood clapboard & wood shingle siding as well as decorative shingling in the front gable, on the flared band between the 1st & 2nd floors, and in the balcony gable. There is a large scrolled pediment over the entrance to the glazed wrap-around porch. A front gabled bay projects over the front of the porch. It has a 2-story faceted bay window on the left side with scroll sawn braces above angled sides finished with a ball pendant 2-story rear ell. There are intact 2-over-2 & 4-over-4 windows. It has authentic wood blinds on the 2nd floor and a foundation of large dressed stones. This is a good example of the Queen Anne style, which enjoyed a brief popularity in Lenox before being eclipsed by the Colonial Revival (another surviving example of this style is the former Congressional Parsonage at 142 Main Street). Like most Queen Anne houses, this one is eclectic, mixing elements such as the Palladian window in the front gable with medieval touches like the patterned masonry chimneys. One of the two chimneys has an oval window inset. This was something of a technological marvel in the 1880’s. The hipped roof with cross gables and varied dormers is a hallmark of this style, although ill-suited to snowy Berkshire winters. 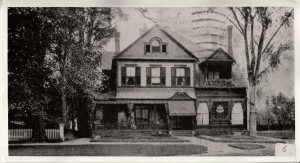 An original front porch and a small second-story porch were later enclosed with multi-paned windows; and the installation of a commercial storefront in one corner of the front façade have somewhat altered the Queen Anne façade. This house was built on the site of an earlier house demolished in the late 1870’s. The lot was purchased from the owner of that house, Lucy Cottrell by Electa Eddy in 1880. In 1885, Charles and Margaret Eddy mortgaged the property for $ 9,000, and the following year sold it to John Egmont Schermerhorn for $25,000. The furnishings of the house were included in this sale, with the exception of several items mentioned specifically in the deed, the famly and household silver and linens, and the “articles of bric-a-brac of a personal and ornamental character”. Mr. Schermerhorn named the house “The Lanai”, perhaps referring to its original porches. 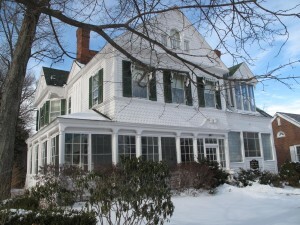 Frank and Mary Newton acquired the property in 1992.